These Vegan Mocha Cheesecake Bites are the perfect healthy treat. They are gluten-free, dairy-free and guilt free. Sometimes I just need coffee…or chocolate…or cheesecake and sometimes I need all three at once! Can anyone relate? 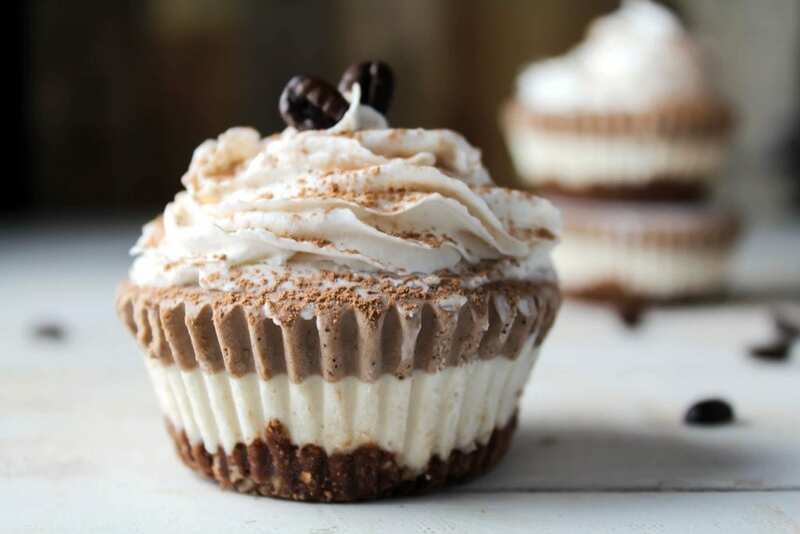 Well, these Vegan Mocha Cheesecake Bites can satisfy those cravings all at once, but in a healthier way. Last week was one of “those” weeks for me. I made delicious recipes to share, but some weren’t photographing the way I would like. Can you believe that some food isn’t photogenic? Trust me, these Cheesecake Bites look innocent and cute, but they were so unruly during the shoot. Frozen desserts…plus hot lighting…equals disaster. I always have a plan before I start shooting, but sometimes it doesn’t turn out the way I imagined it. With frozen desserts, I have to act quickly to change the setup and sometimes, I’m not quick enough. Anyway, I was able to get a few shots in before they quit on me. My shoot officially ended when my light bounce fell on top of them and whipped cream splatted everywhere. Fun! 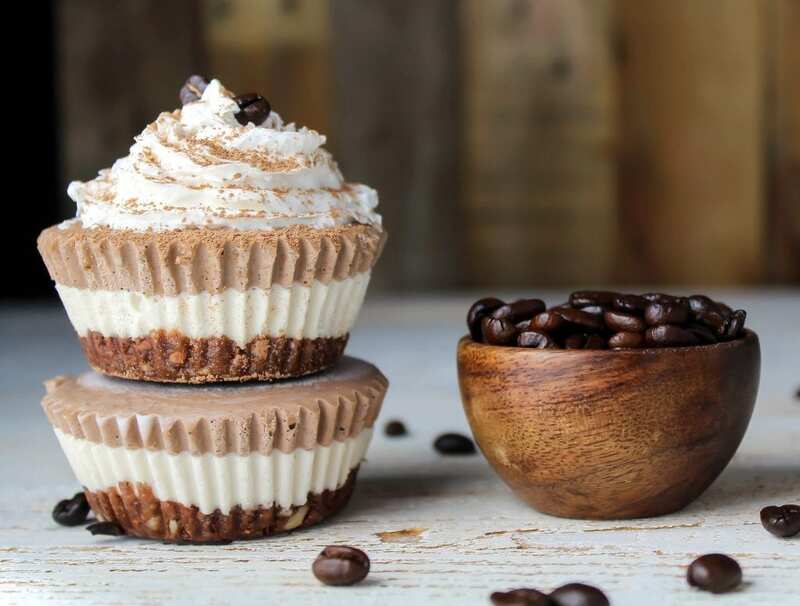 These heavenly Vegan Mocha Cheesecake Bites will satisfy your craving for coffee, chocolate, and cheesecake, but you won’t feel like crap after eating them. Sounds good, huh? You won’t find any processed junk in these babies…they are made up of cashews, coconut milk, almonds, dates, pure maple syrup, coconut oil, pure vanilla extract, cacao powder and espresso powder. They won’t make your tummy hurt from the dairy and processed sugars found in most standard treats. Also, you’ll be giving your body a healthy dose of protein, fiber, vitamins & minerals. You can enjoy them and feel guilt-free. The base layer is a chocolate-almond crust, which is held together by naturally sweet dates. It has the perfect chocolate flavor with a slight almond-y crunch. Next up, is the vanilla layer. It’s soft, creamy, sweet & velvety. It tastes so much better than dairy-based treats. The creaminess comes from cashews and coconut cream. They work magic together! 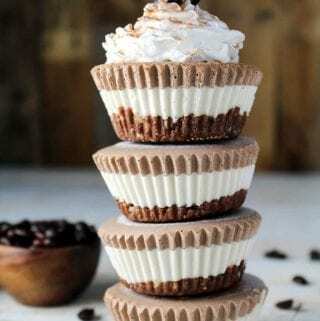 The topping is a decadent mocha layer. It’s rich, chocolate-y and has the perfect hint of coffee flavor. The aroma alone will give you an instant pick-me-up. These heavenly bites are perfect just the way they are, but if you would like to dress them up, you can add dairy-free whipped cream and dust them with cacao powder. 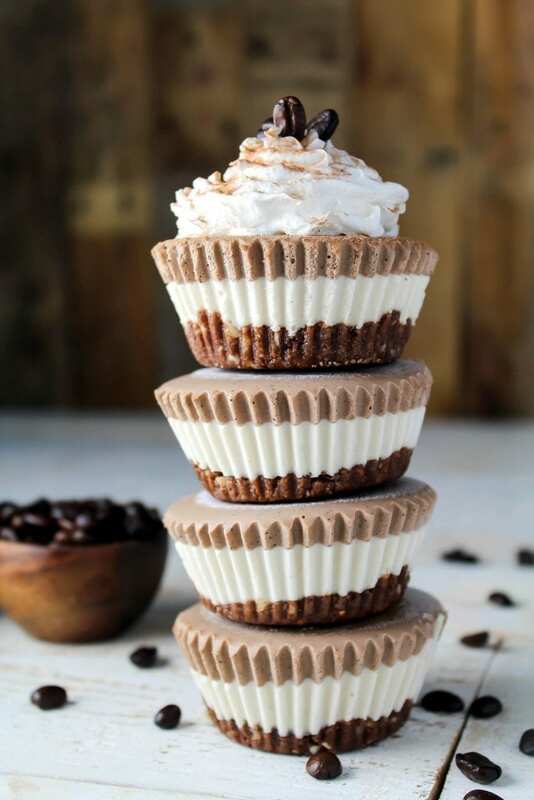 So, are you ready to indulge in these Vegan Mocha Cheesecake Bites, but not feel like you overindulged? These Vegan Mocha Cheesecake Bites are the perfect healthy treat. They are gluten-free, dairy-free and guilt free. They are made with pure & natural ingredients. Place all ingredients into a food processor. Process until if forms a loose dough. Press between your fingers to make sure it sticks together. Add more dates or nuts for the needed consistency. Drain & rinse cashews. Discard soaking water. Combine all ingredients (except raw cacao powder & espresso powder) in a blender or food processor. Blend until really creamy and smooth. Place 2 1/2 tablespoons of mixture on top of crust (for 10 cheesecake bites) Pop back in freezer for about 20 minutes, to firm up the layer a bit. Place the raw cacao powder and espresso powder into the remaining filling. Blend until creamy and smooth. Pour about 2 1/2 tablespoons of filling on top of the vanilla layer. (approximate measurement for 10 cheesecake bites) Freeze for 4-6 hours. Thaw 3-5 minutes before enjoying. Store in airtight container in the freezer. Top with some homemade or store-bought whipped cream. Enjoy! *This recipes makes about 10 cheesecake bites. *DATES: If the dates aren't soft & somewhat moist, soak them in water for 15 minutes, before using. Drain well and pat dry before use. * COCONUT CREAM: If you don't have coconut cream, you can use a regular can of full-fat coconut milk. Don't shake the can before use, just scoop out & use most of the creamier, hardened part. You might need some of the liquid part to make up 1 full cup and that's totally fine. Some brands of coconut milk won't solidify properly. I recommend Native Forest, Trader Joe's and Thai Kitchen. You will still put the can in the fridge overnight & scoop the hardened part out. Save leftover liquid for smoothies or other recipes. Ultimately, you can use the coconut milk, even if it doesn't separate. The bites will still be delicious & creamy, just not as creamy as the other way. *MAPLE SYRUP: If you want to reduce the amount of maple syrup, 1/3 cup gives a nice subtle sweetness. I prefer them like that, but my family likes them sweeter, so I use a 1/2 cup. It all depends on your desired taste. You can also use agave instead of maple syrup. *MOCHA LAYER: If you'd like a stronger coffee flavor, add 1/2 - 1 teaspoon more of espresso powder, depending on your taste. *Prep time doesn't include the freezing time of 4-6 hours. If you’d like to see more cheesecake bites, you might be interested in these Cherry-Coconut Cheesecake Bites. They’re bursting with mouth-watering flavor and have the perfect balance of sweet & tart. Are you supposed to refrigerate the can of coconut cream or only if you’re using coconut milk? Hi Tamika, Sorry for the late response. This comment was in my spam folder 🙁 No, you don’t have to chill the can of coconut cream. Thanks for stopping by. this is amazing! i had a question though, instead of dates can I use dried figs? I would love to make these in a regular cheesecake pan, do the measurements change? Are you using Medjool Dates, or will any pitted work?! Thank you! Do these have to stay frozen or can they be stored in a cooler without melting? Is there anyway to make these with almond milk instead of coconut? Hello, can i substitute cashews for another nuts? Hi Nora, I haven’t tried this with another nut, but I’ve seen many “cheesecake” recipes made with macadamia nuts. Do you have an allergy? Hi, I get confused with coconut cream. I have something called coconut goodness in a jar also I can buy coconut cream in a block is that what I should use. Hi Anne, I don’t believe the coconut cream block is the same. I think it’s more like coconut butter. The coconut goodness is also like a butter. If you don’t have coconut cream, you can use a regular can of full-fat coconut milk (in most stores). Don’t shake the can before use, just scoop out & use most of the creamier, hardened part. You might need some of the liquid part to make up 1 full cup for the recipe and that’s totally fine. Hi Melissa. For the cheesecake base, do you drain the cashews, or do you include the water in the mix? How many calories, grams of fat, etc? 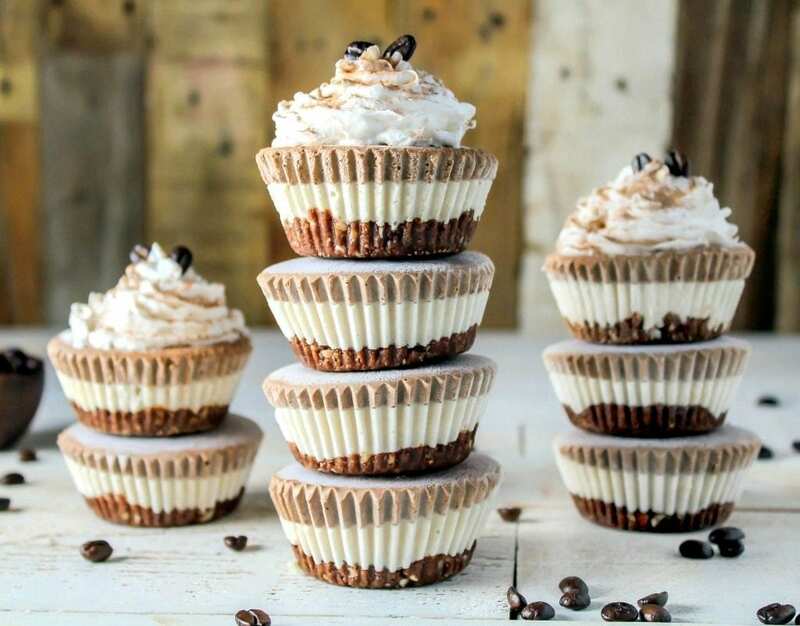 You had me at cheesecake, but then coffee and chocolate added on makes it a must-try! 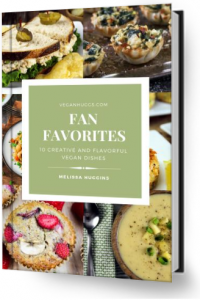 Looks amazing, Melissa! You sure are talented.